mmmm, nothing like some ClAM CHOWdeR on a cold day. love it. 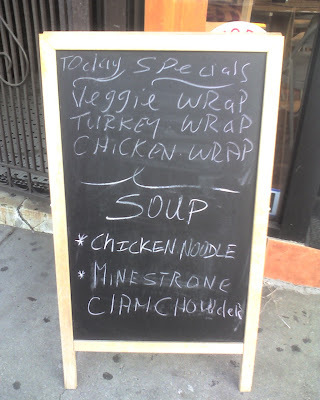 You realize they spelled it CHICKEN NOODLE SOUP. Leaves much for their consistency. They can't decide which 'a' to use on three lines near the top, either! you didn't seem to notice the Veggie WRaP? Maybe they are serving Cia McHowder?